Profile: Tony has been a full time potter for about thirty years before which he worked in advertising and printing. 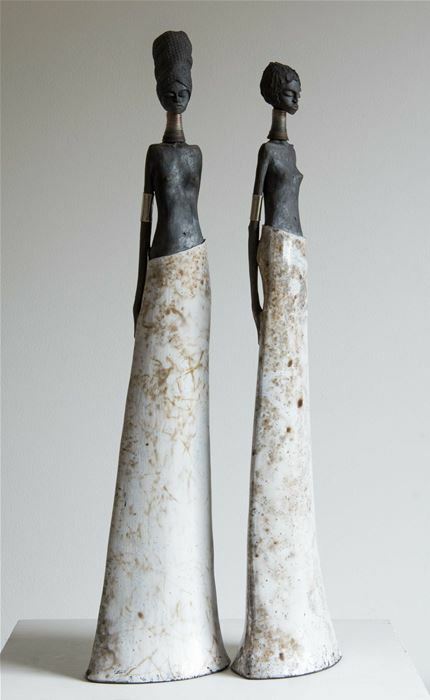 In his work He uses a white clay body and each figure is individually modelled. They comprise two or three sections which are assembled as a finished piece after firing. The separate parts are biscuit fired to 1100 °c in an electric kiln then decorated with glazes or ceramic colours and fired again to 1000 °c. The raku firing is to 780 °c in a small gas kiln in the garden. Each piece is taken from the kiln whilst red hot with tongs and carefully placed in sawdust or other combustible materials. The immediate effect is to blacken the clay but other results can be achieved by controlling the path of the smoke over the surfaces. Pieces are often fired several times to get the desired result. Sometimes silver leaf is applied to the finished figure and patinated with chemicals. He also uses this technique on his ceramic wall pieces. When the figures are assembled more decoration is added in the form of collars and armbands using wire or pewter and sometimes silver and gold.